Article and Videos Coconut Information The Coconut Oil Miracle: Where is the Evidence? The Coconut Oil Miracle: Where is the Evidence? Christine Tomlinson, MD, director of the National Candida Society, in the UK believes in the antibacterial properties of coconut oil, and advises candida sufferers (those with a yeast overgrowth) to include it in their diet. Mary Newport, MD, director of the neonatology unit at Spring Hill Regional Hospital in Florida, is a firm believer in the power of coconut for the treatment of neurological disorders, such as Alzheimer’s and Parkinson’s. She should, her husband suffered with Alzheimer’s for five years before she discovered coconut oil. With the aid of coconut oil he’s making a remarkable comeback. Others claim that it can help with diabetes, cancer, kidney and liver function, vitamin and mineral absorption, digestive problems, immune function, and weight loss. From all the glowing reports coconut oil appears to be a super food with a multitude of nutritional and medicinal uses. In recent years coconut oil has shot to superstardom in the world of health foods. Celebrities area using it, nutritionists are recommending it, and patients are extolling its many virtues. Yet, despite the growing popularity, some people are skeptical. How could one thing have so many health benefits? It sounds too good to be true. In addition, many doctors, dieticians, and other health care professionals have been reluctant to accept coconut oil as a health food. Coconut oil contains a high percentage of saturated fat. Saturated fats have been condemned for so many years, that they find it hard to change their opinions even when faced with evidence to the contrary. The objection they state is always the same: there is not enough evidence to prove that coconut oil is harmless or that it has any health benefits. “If it has any health benefits,” they bellow, “show me the evidence!” They demand peer-reviewed studies published in respected medical journals. By crying “show me the evidence” they are implying that there is little evidence and that there are no such studies available. 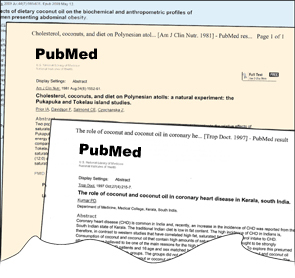 In recent years doctors and editors of health journals are frequently being asked about coconut oil. Most don’t know anything about it and consider it just another passing fad. Their answers reflect this view. The answers are all the same; the health claims are attributed to people selling coconut oil and that there is little or no evidence to back up their claims. Obviously, these doctors did not bother to take the time to research the question but simply gave their uneducated, biased opinions. That’s the problem with those who refuse to acknowledge new advances in science and medicine. They don’t take the time to find out and belittle those who have. Celebrity doctor Mehmet Oz, MD, wrote an article a couple of years ago lambasting coconut oil in the same vein as those above. However, recently Dr. Oz reversed his stance and acknowledged that coconut oil is a healthy food and admitted that he himself now takes it every day. He even included several segments of his TV show to the benefits of coconut oil. (You can view them at http://www.doctoroz.com/videos/coconut-oil-super-powers-pt-1.) If these other doctors were open minded enough and had taken the time to do just a little investigation, like Dr. Oz, they would have seen the overwhelming evidence and become believers too. “Show me the evidence.” That’s the universal battle cry of the critics. Is there sufficient evidence to justify the safety and value of coconut oil? There is actually plenty of evidence, if you know where to look. On the Internet there is a website sponsored by U.S. National Institutes of Health called PubMed (www.pubmed.gov). This is a research tool that indexes nearly 6,000 medical and biological journals published around the world. If you key in the word “coconut oil” you get a listing of all the studies in the database that involve coconut oil. Currently there are 1,315 studies listed. Over thirteen hundred studies, that’s a lot of evidence! New studies are continually being added. We can say to Published PubMed studies graphic the critics are these enough studies? They would probably say “no, we want more studies.” OK, well you can find additional studies by looking up similar search terms like “virgin coconut oil,” “medium chain fatty acids,” “medium chain triglycerides,” “lauric acid,” “capric acid,” “caprylic acid,” and so forth. When you have done that, you will get a listing of over 17,000 studies! How’s that for evidence! This would blow their minds. Some of these studies, however, will be listed twice. So if we take into account some duplication, that still leaves about 10,000 studies on coconut oil. Ten thousand studies should be enough to convince any skeptic, especially when you consider that the FDA grants approval to new drugs if only two positive studies are published. The arthritis drug Vioxx, had only four published studies before it was approved. When new drugs are approved for distribution to the public, why don’t doctors stand up and scream for more evidence? When Vioxx, Baycol, and Darvon were approved why didn’t the medical community rise up in protest asking for more evidence for their efficiency and safety? They should have, since each of these drugs were later taken off the market because they were crippling and killing people. When the Alzheimer’s drug, Aricept, was approved by the FDA in 1996 there were less than 10 studies available, not all of them positive. The effects of the drug have been less than impressive. A few of the studies suggested that some patients may benefit from taking the drug, while others failed to show any benefit. In general, less than half of those taking the drug demonstrate any benefit. When improvement does occur, it lasts only a few months and is not great enough to have any worthwhile effect on the patient’s symptoms or day-to-day functioning. The results have been generally disappointing, nevertheless, the drug was approved and is currently the most wildly used treatment for Alzheimer’s. What price does the patient pay for the possibility of a few months of minor improvement? The price can be measured in terms of the adverse reactions from taking the drug, which may include any number of the following: diarrhea, dizziness, muscle cramps, nausea, fatigue, insomnia, vomiting, weight loss, seizures, and death. Is it worth it? While the benefits are only expected to last a few months, patients often continue the drug for years. Where are the voices calling for more studies on Aricept? Where are the voices challenging its safety? Is it because it is a chemical created in a laboratory that gives it acceptance among the medical community, while coconut oil being a product of nature is looked upon with suspicion? Coconut oil has caused no deaths or harm of any type. It’s been used safely for thousands of years. There is no risk in using it. Thousands of studies have proven its therapeutic worth and tens of thousands satisfied users can attest to its health promoting properties. Coconut oil has proven to be far more effective at treating Alzheimer’s than Aricept.4 Yet, critics still call for more studies on coconut oil. Admittedly, not all of the 10,000 studies involving coconut oil are of equal value, some provide little or no useful information. However, the same is true for drug studies as well, not all of them are useful either. Nevertheless, there are ample studies on coconut oil to clearly demonstrate its many nutritional and medicinal properties. Let’s take a brief look at the evidence behind the modern medical uses for coconut oil. The basic chemistry of coconut oil was figured out back in the 1920s and 1930s. Back then it was discovered that coconut oil was distinctly different from other fats and oils. Coconut oil was found to be composed predominately of a unique family of fats called medium chain fatty acids. In coconut oil these fatty acids are in the form of medium chain triglycerides (MCTs). In the 1930s and 1940s. It was discovered that when coconut oil was added into the diet it improved the absorption of various nutrients. For example, W.D. Salmon and J.G. Goodman at the Alabama Polytechnic Institute (now Auburn University) studied the effects of vitamin B-1 deficiency in animals given different types of fats. Vitamin B-1 deficiency leads to a fatal disease called beriberi. The fats and oils evaluated included olive oil, butter, beef fat, linseed oil (flaxseed), cottonseed oil, and other oils. When rats were given a vitamin B deficient diet, coconut oil was by far the most efficient in preventing the disease and extending lifespan. In fact, those receiving coconut oil actually gained weight, indicating continued growth even though the diet was nutritionally poor.5 None of the tested oils, including coconut oil, contains vitamin B-1. However, coconut oil makes what little of the vitamin that is in the diet more biologically available, thus preventing the deficiency disease. In the 1950s researchers began investigating the nutritional and medicinal uses for MCTs. Harvard researcher Vigen K. Babayan, PhD is credited with developing the process of distilling coconut oil down into pure MCT oil. He called the purified oil fractionated coconut oil or MCT oil.9 A great deal of research followed and it was soon evident that MCTs possessed unique biological properties with a number of important nutritional and medical applications. It was soon discovered that MCTs digest differently than other fats. When swallowed, most fats travel down the esophagus (throat), through the stomach, and into the small intestine where they are broken down by digestive enzymes and bile into individual fatty acids (long chain fatty acids). These fatty acids are then absorbed into the intestinal wall where they are repackaged into bundles of fat, cholesterol, and protein called lipoproteins. These lipoproteins pass into the bloodstream. As they circulate in the bloodstream they release little particles of fat and cholesterol that are utilized by the cells or stored as body fat. Because of the unique way in which MCTs are digested and metabolized they produce an increase in energy and boost metabolism. For this reason, MCTs are used by athletes to improve performance. MCTs or coconut oil are commonly found in commercially produced energy bars and sports drinks marketed to people with active lifestyles. In the 1960s Jon J. Kabara, PhD, a professor of pharmacology at Michigan State University, discovered that MCTs possess potent antimicrobial properties. In his search for a safe means to protect foods from fungal and bacterial contamination he found that MCTs fit the bill. Over the years he and other researchers found that MCTs can kill a wide variety of disease-causing bacteria, fungi, viruses, and parasites.20 MCTs were not only useful in preserving foods, but could be used topically and internally as antimicrobial agents to prevent and fight off infectious disease. Many common disease-causing microbes as well as potentially deadly ones like HIV and drug-resistant bacteria are vulnerable to MCTs.21-22 This aspect of MCTs is extensively researched. There are literally hundreds of studies on this topic and even entire books describing the antimicrobial effects of MCTs. In the 1970s it was discovered that while the liver burns some MCTs immediately to produce energy, others are converted into ketones. Ketones are a super potent form of energy that are used specifically by the brain, but can be used by all the tissues in the body except the liver. Besides epilepsy, ketones have been successfully used to treat a number of other neurological disorders such as Alzheimer’s disease, Parkinson’s disease, Huntington’s disease, ALS, stroke, narcolepsy, brain trauma, and brain cancer. The consumption of coconut oil can increase blood ketone levels to therapeutic levels that can successfully treat all of these conditions. Many patients with Alzheimer’s and other forms of dementia are currently being treated with coconut oil and are achieving far better results than the medications currently approved for these conditions. Studies show that MCTs can effectively mitigate the effects of Alzheimer’s and a dietary supplement designed for this purpose was approved by the Food and Drug Administration (FDA) in 2009 for the treatment of Alzheimer’s. Even heart health is improved with the use of coconut oil. While much criticism has been cast on coconut oil because of its saturated fat content, the evidence supports its heart friendly nature. MCTs are readily used by the heart as fuel. In fact, it uses MCTs in preference to glucose or polyunsaturated fatty acids as a source of energy. Ketones, as well, which are produced from MCTs act as a superfuel for the heart, increasing oxygen delivery by 39 percent and heart function by 28 percent. In fact, researchers at University François Rabelais in France are now recommending the use of MCTs for the treatment of heart diseases. They have shown that the diseased heart is energy deficient and by improving oxygen and fuel delivery, heart function and survival is dramatically improved.31 The fact that that coconut oil is not harmful to the heart and may even be therapeutic is substantiated by numerous studies on coconut eating populations where heart disease rates are among the lowest in the world.32 Many other degenerative diseases are also much lower in these populations such as cancer, diabetes, colitis, liver disease, gallbladder disease, and dementia. Could it be due to the coconut in their diets? Coconut oil has the potential to aid in the protection and treatment of a number of health problems due to its documented antimicrobial, antioxidant, anti-inflammatory, antiulcerogenic, antimutagenic, analgesic, and antipyretic activities.33-34 Scientists and pharmaceutical companies have recognized the importance of MCTs and have filed numerous patents for their therapeutic use in the treatment of Alzheimer’s disease, cancer, dental caries, periodontal disease, skin diseases, and various bacterial, viral, and fungal infections. Apparently the researchers at these companies feel there is ample scientific evidence to invest their time and money in procuring the legal rights to use them therapeutically. Since coconut oil is predominately a medium chain triglyceride oil (63%), “the biological effects of coconut oil are a consequence of the presence of these acids,” says Hans Kaunitz, MD, professor of pathology at Columbia University Medical School and long time MCT researcher.35 Because coconut oil is composed predominately of MCTs, it influence on the body is characterized by theses fatty acids. While critics may question if coconut oil has the same therapeutic effects as MCT oil, they will acknowledge that soybean oil is characterized by linoleic acid because it contains 51 percent of this polyunsaturated fatty acid, or that olive oil is a monounsaturated oil because it is 77 percent oleic acid (a monounsaturated fatty acid), or that fish oil (salmon oil in this case) is characterized by omega-3s because it contains 38 percent omega-3 fatty acids, yet it also contains saturated fat (22 percent) and cholesterol (485 mg/100g). Likewise, soybean oil and olive oil also contain saturated fats, so they are not pure either, but their character is defined by their predominate fatty acids and their saturated fat content is ignored as inconsequential. Conclusion: coconut oil is an MCT oil and its effects on the body are characterized by these fatty acids. This has been observed time and time again in studies and in clinical settings. Some of the nutritional and therapeutic benefits of coconut oil come from the saturated fats in the oil, such as its resistance to oxidation, long shelf life, and superior cooking properties. Some come from MCTs such as the antimicrobial effects and its unique mode of digestion and nutrient delivery. However, most of its medicinal benefits undoubtedly come from the ketones produced from the MCTs. The protective effects on the heart, brain, kidneys, colon, pancreas, and other organs, its metabolic boosting and energizing effects, and its anti-cancer, anti-diabetes, anti-Alzheimer’s and other effects come principally from ketones. If you do a search on PubMed for ketones, as they relate to MCTs and diet, you will find about 25,000 studies. Combining these studies with the 10,000 on coconut oil and MCTs, we have a total of over 35,000 studies describing the effects of coconut oil on health. Is that enough evidence? There is far more evidence demonstrating the safety and efficiency of coconut oil than there are for most FDA approved drugs. Of course, additional studies are welcomed and encouraged, but to state that there is little or no evidence demonstrating the safety and value of coconut oil is simply not true. Coconut oil has been used successfully in traditional medicine for thousands of years, and in western medicine for at least 60 years with no adverse effects. It’s been granted GRAS (i.e. generally recognized as safe) status by the FDA. Regardless of the number of studies available, the real test for the value of coconut oil is how it affects people’s lives. Coconut oil is helping thousands of people with various health problems. Here is a typical example. “I was once diagnosed with lupus, lichen planus (lost all 20 nails), ADD, depression, COPD, allergies, atherosclerosis with chest pain, metabolic syndrome, rapidly progressing to full blown diabetes, high CRP, high cholesterol, high triglycerides, chronic fatigue, and fibromyalgia,” says Peggy M. “I was living on inhalers, antibiotics, prednisone, antidepressants, sleeping pills, allergy meds and more…I began to try alternative things. I am sooooo thankful to say, I have been using organic coconut oil for several years…My thyroid meds continue to be decreased, and I no longer have to take any allergy meds besides shots. I’m afraid to quit them. My breathing problems are totally gone. I have healthy nails, no fibromyalgia, metabolic syndrome, or diabetes.” You can access similar stories here. While testimonies like this may not provide “scientific” proof, tens of thousands of people can attest that coconut oil has changed their lives for the better. Medications may give good results in laboratory settings, yet in real life prove disastrous (i.e. Vioxx). Coconut oil has proven its worth in real life. Whenever someone says, “Show me the evidence,” give him a copy of this article and say “here is the evidence check it out if you want to learn the truth.” If they demand more evidence, refer them to books such as Coconut Cures or Stop Alzheimer’s Now. Every health claim made in regard to coconut is backed up by published research and historical facts. Each book includes hundreds of references to medical studies. Cunningham, E. Is there science to support claims for coconut oil? J Am Diet Assoc 2001;111:786. McDougall, J. The newest food-cure: coconut oil for health and vitality. The McDougall Newsletter 2006;5:5. Newport, M. Case study: dietary intervention using coconut oil to produce mild ketosis in a 58 year old APOE4+ male with early onset Alzheimer’s disease. 25th International Conference of Alzheimer’s Disease International (ADI), March 10-13, 2010, Greece. Salmon, W.D. and Goodman, J.G. Alleviation of vitamin B deficiency in the rat by certain natural fats and synthetic esters. Journal of Nutrition 1936;13:477-500. Tantibhedhyangkul, P. and Hashim, S.A. Medium-chain triglyceride feeding in premature infants: effects on calcium and magnesium absorption. Pediatrics 1987;61:537-545. Vaidya, U.V., et al. Vegetable oils fortified feeds in the nutrition of very low birthweight babies. Indian Pediatr 1992;29:1519-1527. Wang, X, et al. Enteral nutrition improves clinical outcome and shortens hospital stay after cancer surgery. J Invest Surg 2010;23:309-313. H., et al. Nutritional properties of the triglycerides of medium chain-length. J Am Oil Chem Soc 1958;35:10-13. Kiyasu, J.Y., et al. The portal transport of absorbed fatty acids. J Biol Chem 1952;199:415-419. Burke, V. and Danks, D.M. Medium-chain triglyceride diet: its use in treatment of liver disease. Brit Med J 1966;2:1050-1051. Kuo, P.T. and Huang, N.N. The effect of medium chain triglyceride upon fat absorption and plasma lipid and depot fat of children with cystic fibrosis of the pancreas. J Clin Invest 1965;44:1924-1933. Cancio, M. and Menendez-Corrrada, R. Absorption of medium chain triglycerides in tropical sprue. Proc Soc Exp Biol (NY) 1964;117:182-185. Isselbacher, K.J., et al. Congenital beta-lipoprotein deficiency: an hereditary disorder involving a defect in the absorption and transport of lipids. Medicine (Baltimore) 1964;43:347-361. Holt, P.R. Dietary treatment of protein loss in intestinal lymphangiectasia. Pediatrics 1964;34:629-635. Greenberger, N.J., et al. Use of medium chain triglycerides in malabsorption. Ann Internal Med 1967;66:727-734. Zurier, R.B., et al. Use of medium-chain triglyceride in management of patients with massive resection of the small intestine. New Engl J Med 1966;274:490-493. Baba, N., et al. Enhanced thermogenesis and diminished deposition of fat in response to overfeeding with diets containing medium chain triglycerides. Am J Clin Nutr 1982;35:678-682. St-Onge, M.P. and Jones, P.J. Physiological effects of medium-chain triglycerides: potential agents in the prevention of obesity. J Nutr 2002;132:329-332. Kabara, J.J., et al. Fatty acids and derivatives as antimicrobial agents. Antimicrobial Agents and Chemotherapy 1972;2:23-28. Hilmarsson, H., et al. Virucidal effect of lipids on visna virus, a lentivirus related to HIV. Arch Virol 2006;151:1217-1224. Kitahara, T., et al. Antimicrobial activity of saturated fatty acids and fatty amines against methicillin-resistant Staphylococcus aureus. Biological & Pharmaceutical Bulletin 2004;27:1321-1326. Ogbolu, D.O., et al. In vitro antimicrobial properties of coconut oil on Candida species in Ibadan, Nigeria. J Med Food 2007;10:384-387. Neal, E.G., et al. A randomized trial of classical and medium-chain triglyceride ketogenic diets in the treatment of childhood epilepsy. Epilepsia 2009;50:1109-1117. Eckel, R.H., et al. Dietary substitution of medium-chain triglycerides improves insulin-mediated glucose metabolism in NIDDM subjects. Diabetes 1992;41:641-647. Kono, H., et al. Dietary medium-chain triglycerides prevent chemically induced experimental colitis in rats. Transl Res 2010;155:131-141. Zakaria, A.A., et al. Hepatoprotective activity of dried- and fermented-processed virgin coconut oil. Evidence-Based Complementary and Alternative Medicine 2011;2011:142739. Monserrat, A.J., et al. Protective effect of coconut oil on renal necrosis occurring in rats fed a methyl-deficient diet. Ren Fail 1995;17:525-537. Mizushima, T., et al. Prevention of hyperlipidemic acute pancreatitis during pregnancy with medium-chain triglyceride nutritional support. Int J Pancreatol 1998;23:187-192. Kono, H., et al. Medium-chain triglycerides enhance secretory IgA expression in rat intestine after administration of endotoxin. Am J Physiol Gastrointest Liver Physiol 2004;286:G1081-G1089. Labarthe, F., et al. Medium-chain fatty acids as metabolic therapy in cardiac disease. Cardiovasc Drugs Ther 2008;22:97-106. Prior, I.A., et al. Cholesterol, coconuts, and diet of Polynesian atolls: a natural experiment: the Pukapuka and Tokelau island studies. Am J Clin Nutr 1981;34:1552-1561. Zakaria, A.A., et al. In vivo antinociceptive and anti-inflammatory activities of dried and fermented processed virgin coconut oil. Med Princ Pract 2011;20:231-236. Intahphuak, S., et al. Anti-inflammatory, analgesic, and antipyretic activities of virgin coconut oil. Pharm Biol 2010;48:151-157. Kaunitz, H. Nutritional properties of coconut oil. J Am Oil Chem Soc 1970;47:462A-466A.